It’s shaping up to be a landmark year for changes affecting both employers and employees. Many new laws and regulations sponsored by the Obama administration were recently enacted or will took effect in January 2017. Will they be rolled back? We will find out when Donald Trump begins to move forward on his policy objectives and benefits from Republican control of both Houses of Congress in its 115th Session. It is anticipated that the new administration will enact significant measures that may counteract some of the measures enacted during the Obama administration. In addition, Trump will quickly seek to fill Judge Scalia’s Supreme Court position, along with 103 Federal District Court and Appellate Court judicial vacancies. Also lurking is the proposed Midnight Rules Relief Act, which permits Congress to nullify last minute regulations and actions by President Obama in a wholesale fashion. It is estimated that between November 8 and December 31, 2016, 145 regulations were issued—the most since 1933. During Obama’s administration, he enacted a series of changes that affected federal contractors. His actions included the Fair Pay and Safe Workplaces Executive Order, requiring government contractors to report labor law violations when bidding; the paid sick leave regulations, which gives employees 56 hours of leave each year; pay transparency provisions; LGBT non-discrimination mandates; and the enhanced federal minimum wage of $10.20. In addition, the National Labor Relations Board (NLRB), the Wage-Hour Division of the Department of Labor, and the Occupational Safety and Health Administration (OSHA) became far more active. For example, the Fair Labor Standards Act (FLSA) overtime rules were issued, making overtime available to 5 million more workers, but these regulations are currently on hold. The Equal Employment Opportunity Commission (EEOC) also expanded the EEO-1 reporting obligation, requiring employers to annually report W-2 pay data by gender, race, and ethnicity. OSHA also created new injury reporting requirements, which limit post-accident drug testing and safety incentive programs, and raised penalties by 78%. to the NLRB, changing the complement to 3 Republicans and 2 Democrats. He will also appoint the new NLRB General Counsel, who sets the litigation and enforcement priorities for the Board. A new EEOC Chairman and its General Counsel will also be selected by him. These key posts will set the tone and agenda for those agencies, which is anticipated to be enact less vigorous regulations that are friendlier toward employers. 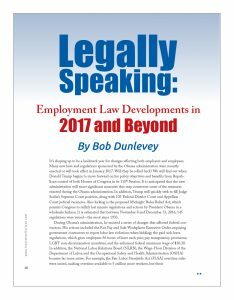 Of course, even if the government ends up taking a less strict regulatory stance, states and municipalities will likely continue more employee-focused initiatives, such as a minimum wage increase, paid sick leave, parental leave, LGBT rights, pay equity, and predictable advanced work scheduling for employees. Multi-state employers may find it even harder to keep track of their legal obligations as state and local legislators adopt a wide variety of differing labor laws. • The new FLSA overtime rules, which are on hold, will be revised and installed with modification. Expect the $455 per week salary requirement to be increased by $100–$200, but not to the $913 required per week in the most recent regulations (now on hold). Automatic escalator provisions to raise the salary requirement periodically will likely go away. • The federal minimum wage will be increased from $7.25 per hour to approximately $9.50 per hour over multiple years; numerous states will enact their own minimum wage requirements, moving toward $13 per hour. • E-Verify, which requires certain employers to check on the legal status of workers before hire, will be broadened to require that all employers ensure that their applicants and employees are properly documented to work—stronger enforcement will be seen in an effort to weed out the estimated 5% of the U.S. workforce that is undocumented. • Employer paid maternity leave for 6 weeks will be enacted in hopes of staving off the initiative to modify the Family and Medical Leave Act (FMLA) to make its 12 weeks fully compensable. • The NLRB will modify its rulings restricting the rights of employers to promulgate rules and regulations pertaining to employees’ use and abuse of social media and restrictions on policies and work rules within employee handbooks. The expansion of the joint employer doctrine, which causes separate entities to be co-liable, will eventually revert to the prior less stringent standard. • The Affordable Care Act will be repealed and replaced with a somewhat similar structure with limited federal insurance subsidies, no employer mandate, no “Cadillac tax,” and competition across state lines for health insurance companies—the transition will be slower than anticipated. • Unionization in the private sector will continue to be quite limited at about 6.7%, but public sector unionization will remain at the level of approximately 35%. • Multi-employer pension plans will continue to face long-term unfunded vested benefit shortfalls, causing some employees to receive less retirement benefits than promised, but Congress will not enact further legislation to correct the problem. The only certain thing about 2017 is that changes are coming.